Purchase one (1) unit of Samsung device/wearable in a single receipt from any SAMSUNG authorized dealer during the contest period and retain the original receipt as proof of purchase. Switch on your device/wearable/tablet and set up your Samsung account. Type (SAMSUNGCNY) <SPACE>(CONSENT (Y))<SPACE>(NRIC)<SPACE> (IMEI NUMBER/SERIAL NUMBER)<SPACE>(FULL NAME) and send to 33310. Participants will be charged 30 cents for each SMS received. The charges are in addition to the standard SMS fee charged by the participant’s mobile phone operator. Participants will receive a confirmed notification via SMS. Retain the original receipt with matching receipt date, store name and address as proof of purchase. Once shortlisted, participants will be required t to provide the proof of purchase to organiser. 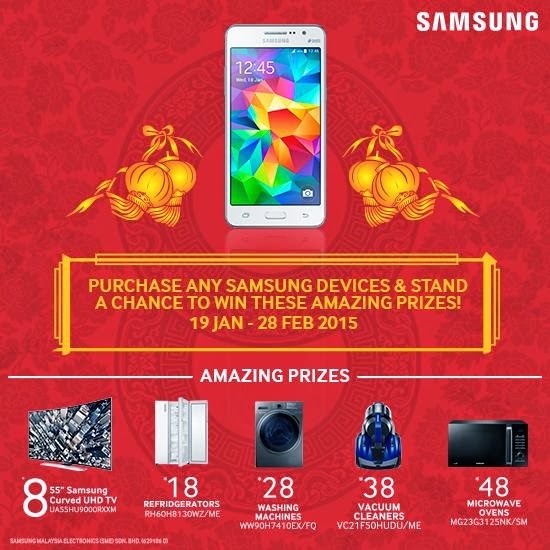 Visit SAMSUNG "The Joy of '8'" contest page for more details.